If there was one thing this movie excelled in, it was the advertising leading up to its release. I saw video ads on Facebook, trailers on television, and all sorts of viral marketing. Consequently, while the film looked neat, I didn’t really know what it was about. Fast forward to months later when it arrived at the cheap theater in town and I decided to go see it. Within the first few minutes, I was somewhat surprised to learn that this movie was based on an obscure comic book series. Not that this really surprises me any longer. Sure, the superhero comics are bringing in big money at the box office, but the more “adult” comics (also sometimes known as “graphic novels”) have been seeping in over the years as well, in part due to adaptations like V for Vendetta (2005) and Watchmen (2009). Even in this year alone, we’ve seen Valerian and Laureline adapted into Valerian and the City of a Thousand Planets (2017). With this fact in mind, I saw many scenes and shot compositions in Atomic Blonde (2017) that could have easily been pulled from the panels of a comic book. In this way, it was likely successful for capturing the same feel as the comic. With the rarely seen setting of Berlin at the end of the era of “The Wall,” Atomic Blonde brings espionage and brutal violence to its message about being unable to trust anyone in the spy industry (kind of a no-brainer). The addition of catchy 1980’s music over the brief spurts of gratuitous violence made these sequences bearable. That being said, when it goes full-bore John Wick (2014) with a steady fight sequence that seems to take forever, there’s no music to help the audience get through it. At times, the plot was a little hard to follow, but the twists at the end (while being semi-predictable) were well done. 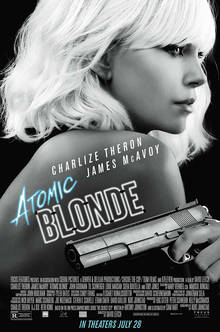 Another niche comic book adaptation with some unique aspects, I give Atomic Blonde 3.5 stars out of 5.